I decided today that my blog/site/whatever-you-want-to-call-it needs a little kick in the pants. Something that lets me show my true colors--or at least yammer on about what I see as the industry's current "its" or, um, "(sh)its." Not sure how often it will show up here. Probably as often as the fancy strikes me. Hopefully it gets you to think or chuckle or vomit or whatever you need to do to feel excited about your favorite past time. 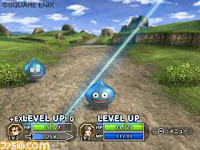 IT: Dragon Quest Swords shapes up for the Wii--I'm pretty sure I yawned when I first saw this game. An on-rails, hack-and-slash game featuring characters from the Dragon Quest universe? I think I'll pass. What a difference a few screen shots make. Every image and video released for this game looks better than the last, and it has quickly jumped to the top (or near the top) of my "must buy" list. I'd still like to see a "real" Dragon Quest show up on Wii, but this should be lots of beautifully mindless fun regardless. (SH)IT: More Nintendo delays--Sorry to be so Nintendo-centric lately. I just h ave the big N on the brain, I guess. Anyway, there's no denying the truly sucky news of the week comes straight from Camp Redmond. Although news broke today about some interesting/exciting new games for the DS and Wii, Nintendo also dropped a few bombs: Zelda: Phantom Hourglass won't be coming out anytime soon, nor will Wii Metroid or Mario. At least Super Paper Mario is still coming out in April. Right? Right?? Are your favorite game characters (gulp) gay?